Does Baseball Need New Rules? Last night, in the 12th inning of a game against the Florida Marlins, the above gruesome incident occurred. Let me set the scene for those of you who haven’t seen it. Top of the 12th inning, Marlins with a the lead run on third base (Scott Cousins, OF), and Emilio Bonafacio at the plate. Bonafacio hits a fly ball to right field. Cousins tags up and, when Giants outfielder Nate Schierholz makes the catch, he dashes for home. Schierholz throws the ball to Giants catcher Buster Posey in plenty of time, but Cousins barrels into Posey. The bone-rattling collision not only causes Posey to drop the ball, it causes Posey’s left fibula to break and several tendons in his ankle to strain. Ouch. Was this a dirty play? No. It was definitely a hard-nosed play, but nothing dirty went on. As Rube Baker puts in in Major League II, “You’re standing on the tracks, and there’s a train comin’ through, butthead.” Running into the catcher is one of only a handfull of times where physical contact is actually allowed in baseball. It’s part of the reason that catchers wear all that gear (or maybe running into the catcher is allowed because of the gear they wear). The fact of the matter is that catchers get run over all the time, and they often get hurt. In the 1970 All-Star Game, Pete Rose separated Ray Fosse’s shoulder in a home plate collision (“This is supposed to be an exhibition! An exhibition!” – Apollo’s Trainer in the Drago fight in Rocky IV). In 1985, Blue Jays catcher Buck Martinez broke his leg in a collision at home plate (he got the out, and then another one when a 2nd runner tried to score over his crumpled up corpse). In spring training of 2008, current Yankees backup catcher Francisco Cervelli fractured his wrist in a collision with Rays utility man Elliot Johnson. Posey’s injury was just the latest of many through the years. Getting run over from time to time is just part of the job description, but should it be? The latest devastating injury has led nay sayers to come out of the woodwork to challenge the lack of protection for major league catchers. To me, the answer is very simple. If someone can come up with a way that makes sense to protect catchers from being collided into, while not ruining the integrity of the play at the plate, then I’m all for it. Anybody have any suggestions? Who decides if there is “no place to go”? The umpire? Do they tell the runner before hand, does the runner have to make a split second decision as he’s running towards home plate? Does the coach tell him? How about the batter on deck? I don’t think there is any way to really practically decide that. It would have to be a situation where you are either allowed to hit the catcher 100% of the time, or 0% of the time. If it’s zero, what happens on a close play? Do you have to slide like in little league? I understand these rules being in place in high school and college. We do not want kids who are still starting their careers or, in some cases, still physically developing, to have devastating injuries like the one suffered by Buster Posey last night. To be blunt, baseball is a man’s sport. It is played by men. If we wanted to protect everyone from any physical injury, and not allow any physical contact without penalization, we’d call it basketball. What’s next, change the NFL to two-hand touch? Catchers wear padding all over their bodies. I feel that, if anyone, Buster Posey himself is more to blame than the current rules or Scott Cousins of the Marlins are. As a catcher you need to anticipate getting hit, and be in position to handle it as safely as possible. 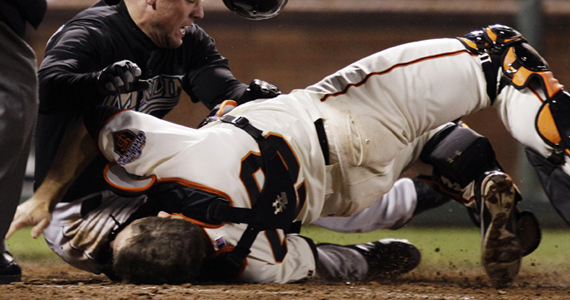 Posey was too low to the ground, which caused his legs to fold up underneath him when he was hit. Had he been standing a little more upright, he would have been knocked onto his backside. Could he still have gotten hurt? Of course! Is it ridiculous to put blame on Posey for getting slammed into full speed by a base runner? Absolutely! However, it is just as ridiculous to blame Cousins, or the rules of baseball, or anything else other than really terrible luck. I think it is a terrible shame that Buster Posey, one of the rising young stars of baseball, now has to probably miss the rest of the season due to an injury. It could devastate the Giants’ chances of repeating their World Series title of a year ago. It could alter his career. It mucked up one of my fantasy baseball teams, and I had to pick up J.P. Arencibia. It was a terrible incident, but let’s get off our soap boxes and move on. Buster will be back in 2012, and it will still be legal to slam into the catcher. If you don’t like it, play first base. Couldn’t find the rest, but I think your thirst for violence has been quenched.